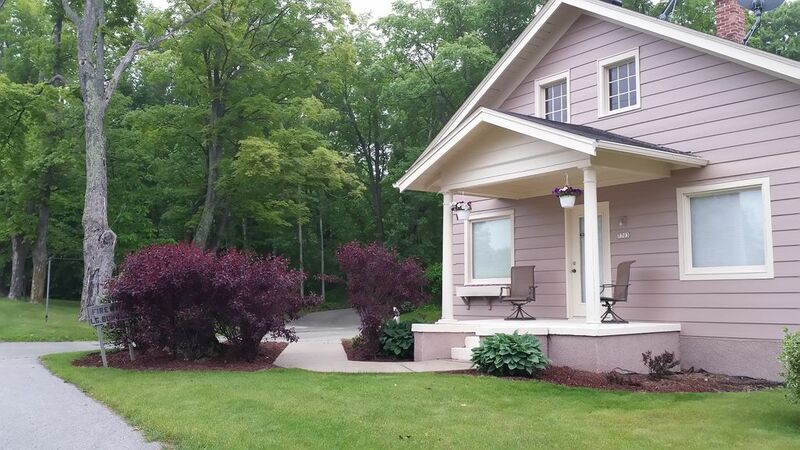 Enjoy beautiful Door County and Larsen Log Cabin at all times of the year. 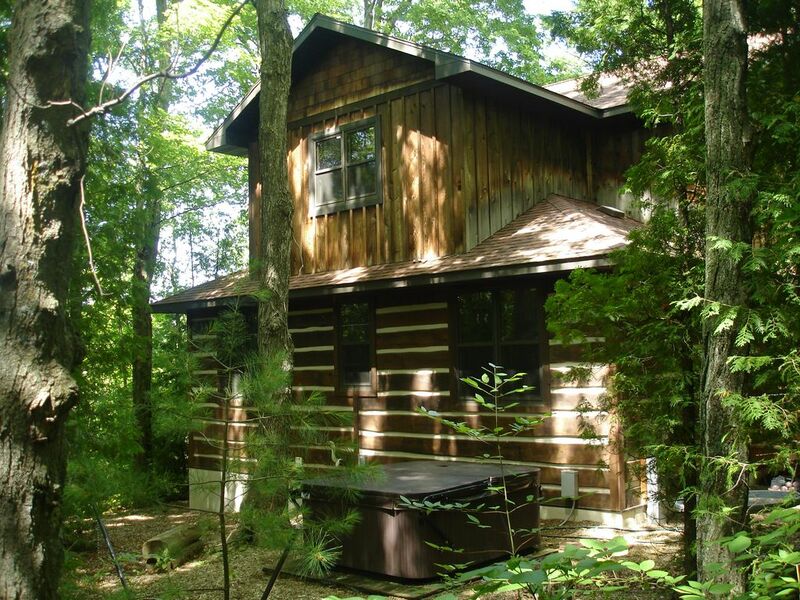 Larsen Log Cabin built in 2005 rest on a beautiful wooded site in the heart of Egg Harbor. To feel like you are vacationing in Door County, you need to be in the best part of Door County. The Door Peninsula is where it's at, and where we are at. The fun, the beauty, the water, the site seeing and all the activities surrounds you here at Larsen Log Cabin. We are less than a minute away from the marina and beach, drop your boat in or go beaching at Village Park. Leave your car at the cabin; it's only a 5 minute walk into the village center where you can visit the Marina, Waterview Park, Village Park Beach, bakeries, grocery store, fine and casual dining, coffee shops, gift shops, parks, spas and saloons. Enjoy all the activities to the extreme, from water skiing to cross country skiing and everything in between. Wondering if Larsen Log Cabin is as nice as it sounds, don't worry it is....this is our pledge to you. ﻿Rates: Based on Occupancy starting at 4 guest $1899 per week, Saturday to Saturday in the summer months. Special Events such as Pumpkin Patch Festival, rates will change. We have 2 person 2 night winter and spring specials $150 per night. Taxes of 11% not included in rates. We have minimum nights at different times of the year, 2 or 3 night stays. We will email you a customized quote and our policies included on our confirmation page. Property exterior is monitored. Please avoid issues by not mistating your occupancy. The rate does not include use of the hot tub. Just remodeled, maple hardwood and tile floors, The Best Location! The Larsen House is perfectly located for guest that like everything surrounding them, beaches, kayak rental, marina, shops, dining, night life, concerts, groceries, bakeries, and all is in walking distance. Golf Courses, Parks, Music Festivals, Outdoor Theater and so much more is a few minutes or short drive away. Our home has had much remodeling done, refinish maple hardwood floors, new full bathroom, interior freshly painted, two new windows, new beds and furniture, much more. We have central air conditioning and a new wall mounted 50' HDTV Directv and a BluRay Player! New outdoor furniture and grill in a big back yard for your use as well a Big Fire Pit. And to me, one of the most important parts of a vacation rental is cleanliness. Our home will go through a rigorous cleaning and fresh sheets put on all 3 beds prior every check in. The Larsen House is a lower cost nice clean rental offering flexible nights. The sidewalk to the village is in front of the home.